Tis the season! Since I’m sending my wish list to Santa, I figure the books don’t have to be released just yet, right? Maybe he’s got a little Christmas magic up his sleeve! Second book syndrome? Not even close. To be honest, I’m always wary of the second book in a series. Will it be as good as the first? Will I feel let down? Is it just a vehicle to get from book 1 to book 3? For me, Vanish surpassed my expectations. I loved this book! While Firelight was engaging, Vanish was captivating. Although there were certain aspects that were perhaps predictable, there were still quite a few twists that I didn’t see coming and which really gave the story additional substance for me. Aspects I really enjoyed? Jacinda was less self-centered in Vanish which helped me warm up to her and be more empathetic to her angsty teen emotions. Instead of remaining focused solely on her own plight, she was more aware of the struggles and sacrifices of those around her. We also get to learn more about the inner working of the pride (finally!) and the draki society. I, for one, was left wanting more in Firelight and Vanish doesn’t disappoint. We get up close and personal with the draki and the harsh realities of life within the pride which frustrated me at times, but for which I have high hopes in book 3. Most of all, I was thrilled to see the relationship between Cassian and Jacinda grow in Vanish. I was curious to see if there might really be something between the two, aside from the obvious pressure and expectations of the pride, and if her infatuation with Will was truly genuine and lasting. Oh, yeah. And I shouldn’t forget to mention that Sophie Jordan once again proves she is a master of the cliffhanger ending. I actually kept turning the pages thinking I accidentally skipped a page before I had that moment of clarity in which I realized Vanish had ended and that I would be desperate to get my hands on book three in the series. The one thing I still can’t figure out? If the pride is living in the mountains more or less off the grid for all intents and purposes, what’s the deal with all of the modern conveniences like cable? Still, I’m eagerly awaiting Hidden (Firelight #3) which is scheduled for release next year. This week, a fellow blogger commented on my blogs’ new look and while I was thrilled that the new design was well received (don’t we all love compliments? ), I had a moment of red faced embarrassment. 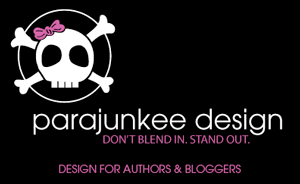 In the rush to make the change from Blogger to WordPress and in figuring out how to use the new format, I was completely remiss in not giving a big, gigantic, over-the-top shout out to Rachel over at Parajunkee Design for doing a fabulous job designing my new look! THANK YOU RACHEL!!! YOU ROCK!!! Rachel did all of the design work (not to mention all of the heavy lifting to get me from Blogger to WordPress and up and running at my new domain). I can’t say enough about how much I love the new look and how much I appreciate her patience in working with me to get the design just right! Over the last few months, I’ve had a wee little bit of blogger envy every time I saw one of Rachel’s amazing designs unveiled, but no more! Now I have my very own PJ design and I couldn’t be happier with it! Me, my polkda-dot pajamas, and my Kindle with Sophie Jordan’s Vanish. In retrospect, maybe I should have waited until tomorrow to do my post…. when I was properly dressed! It was starting to feel like November might never arrive, perhaps because I’ve been looking forward to it for so long. Not because I particularly love November or because I’m looking forward to the Thanksgiving holiday (although I do love turkey! ), but because there are a whole stack of books releasing this month that I can’t wait to get my hands on! Now I just have to find the time to read them all. Maybe we’ll get lucky and another Nor’easter will grace the east coast leaving me cuddled up at home with a good book for days! What books are you waiting for? I’m always looking for new titles to add to my TBR list! Love, love, love Patch… and the book. If you’re waiting to read Silence, stop waiting! Go get your copy. Now. Initial reactions? Silence has all of the qualities I loved from the first two books in the series and then some. Impossible romance, mystery, danger, deceit, angel lore, and yes, that always fun teen wit. When Crescendo ended so abruptly I wanted to throw my Kindle at the wall. I was frustrated and curious and dying to see how Patch and Nora would escape their latest challenge. In retrospect I begrudgingly admit that it was worth the wait. I was surprised to discover how little time had passed at the opening of Silence and was sucked in immediately. I couldn’t tear through the pages fast enough to figure out what exactly had happened. And I wasn’t disappointed. The story, which was crafted with great care, went in a direction I couldn’t possibly have anticipated and unfolded wonderfully. Again, I found myself on the edge of my seat yelling at Nora with frustration, but also with more emotion and adoration than I would have given her in the past. Why? Because Nora finally grew a spine. (Thank you Ms. Fitzpatrick! It was long overdue and much appreciated!) Maybe it was just me, but in the first two books, Nora felt a bit more like a girl being tossed in the wind, just trying to keep her head above water. In Silence, Nora has grown a bit and comes across more as a woman on a mission. The kind who doesn’t give up and who stares down danger in the name of principle. Or maybe it’s just good old fashioned determination. Either way, I felt more connected to Nora in this book than in the previous two where, quite honestly, I just wanted more Patch. (Added bonus, we finally get to see where Patch lives after that little cliff hanger at the end of Crescendo. Talk about a torturous wait!) In Silence, I found myself in Nora’s shoes trying to imagine how I’d react to rediscovering my past, uncovering the betrayal of those closest to me, and following my heart even when my head couldn’t make sense of the feelings within. I was relieved when Silence didn’t end with a cliffhanger, but am intrigued to see where the story of Nora and Patch goes next. Fitzpatrick has opened the door for the fourth book in the series and I can honestly say that I hope Nora continues to find her strength and that maybe, just maybe, the couple can finally catch a break! * FTC disclaimer: Like all books reviewed on my blog, I purchased this book for my Kindle and received no compensation for my opinion– It’s just that… my opinion.